Although there is a slight danger to be run over by a boy on a bicycle, they decide that Boston is a nice place to hatch ducklings. So, they choose a quiet island on Charles River. They make friend with the policeman called Michael who feeds them peanuts every day. Mrs. Mallard lays eight eggs and sits on them to hatch. Soon, the Mallards have eight ducklings: Jack, Kack, Lack, Mack, Nack, Oack, Pack and Qack. Shortly, the daddy duck leaves to survey the river and the mama duck teaches her ducklings the basics. They are to meet in a week in the Public Garden. When the time is up, Mrs. Mallard lines up her eight ducklings and heads out. They walk and waddle till they come at the highway. But every time they try to cross the street, the cars are speeding by. They quaked and cry but the cars would stop. Hearing the noise, Michael the policeman rushes to help. He stops the cars and let the ducks cross the street. Then he rushes to the phone to tell the police station that a family of ducks is on its way to the Public Garden and they should send a police care to help them cross the streets safely. And so, The Mallards make it to the park where they meet Mr. Mallard and people feed them peanuts again. 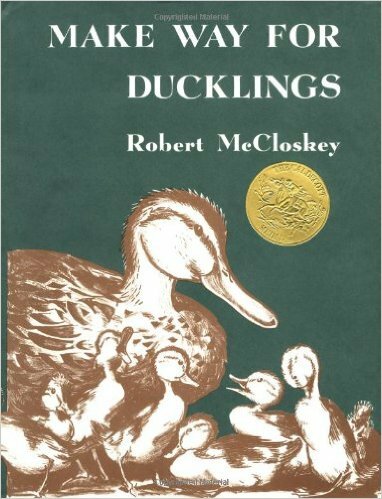 Illustration: Robert McCloskey is also the illustrator of this book. The drawings are very detailed and realistic. Expect to see depiction of places, streets, parks and other views. There is no other color then brown, a kind of sepia ton look of the book. The ducks are lovely.